Death Metal Underground: Analysis of Dismember's "Override of the Overture"
A long tremolo riff beginning in the natural minor scale built from what is at first an obvious selection of notes, bursts through at break neck speed creating one of the most memorable motifs in all of metal and affirms the beginning of one of the greatest death metal albums of all time. Through the use of a diminished fifth (dissonant interval popularized by Black Sabbath) and by not returning to the root note intrigued is created until the second guitar joins the fury to resolve the melody. The melody is resolved not by returning to the root note or the idea of using more consonance but by embracing the surrounding chromatic notes to add more power to the music as it guides by the hand into a place of immeasurable power. An obvious reference to the melodies that the previous generation of heavy metal bands used to introduce to a song and the ongoing themes through a more static approach based less on the development of ideas but on a strong set of interconnected ideas that very rarely changed. 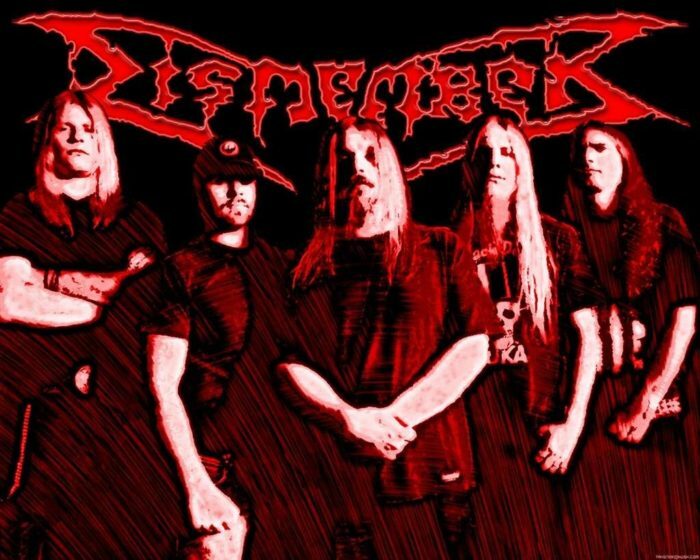 Dismember change this by allowing their melodies to derive into the chromatic territory that their ancestors would be able to conceive and allow their melodies to mutate with those notes. As much as they may seem like a simple idea on paper using it effectively is particularly difficult but to tread on the thin line between tonality and chromaticism and to end up with a melody that does not sound confused. A more rhythmically developed riff divided into a question and two answers makes way as the vocals wait to emerge. The question forces you to grasp the root note ending on sixteenth notes begging for the answers to complete it. The first answer being a phrygian dominant melody with the root note a semi tone above and a diminished fifth creating even more tension until the second answer mutates the main melody by removing a lot of the notes to a more conventional harmonic minor melody allowing for a feeling of partial resolution as the vocals enter after the second iteration By alternating dissonance and related melodies Dismember show an understanding of how to create heaviness without compromising on musicality and through nuance make their music much heavier than it would be without the consonant melodies. Matti Karki gives the impression of just shouting but in reality used a standard higher rasp typical of early death metal bands but emanates the sound near his chest giving it a very mid range quality and increasing the listener’s ability to understand what is actually being said. The song title and the opening lyrics indicate that this riff is the negation of the overture and the beginning of something much grander even though there are very few album openings as powerful as what we just witnessed. An incredible claim that manages to hold true as we feel the power being described. Slow power chords in an even shorter sequence add gravity and change the pace naturally by maintaining the same tempo. Tremolo melodies and single note melodies complement the chords and remain within the confines of the minor scale. Combining heavy metal tropes with the quintessential death metal tremolo riff adds even more power to what is in fact a musically simplistic idea. The melodies are all built on a slight variation of the overture but by removing the dissonances and slowing down the drums, this simple idea maintains strength but offers slight respite and is the perfect adaptation of the heavy metal chorus in a death metal context. Linear chugs bring us to the next of idea which looks to completely destroy everything in a blind stupor. Where other bands would look to develop by expanding ideas, Dismember decide to return to their punk roots by smashing aggressively the chords from the second melody’s phrygian chord progression. Single notes slip through this riff that epitomizes the brutality of the Swedish scene. The narrator returns with an obvious Slayer reference but through the power felt previously brings us into the world of nihilism accepting death. Without fatalism our narrator is genuinely curious about how his life will end and kind of suffering that may entail. The second part of the overture returns and combats the deconstructed riff as the second iteration of the deconstructed theme emerges and is cut down even more. Melody alternates with primal force as our narrator continues to share his thought process in how human life is worthless in the face of death. The overture blasts through once more but this time is opposed by the second chord progression but this time descending rather than ascending. Juxtaposed with the first few notes of the overture but played in single notes as to counteract the power chords by ascending giving a strong feeling of descent into hell. By arranging the motifs seen before, the song maintains cohesiveness and allows the idea of forward motion without having to resort to cheap tricks. As cohesiveness is maintained the song may than twist and turn freely without sacrificing comprehension to expose communication. The opposition created by the inversion of previous motifs shows that the narrator has changed his perception of equating death to suffering and begins to accept that while may this life may end another may begin. The second overture theme greets us again as the opposing ideas continue to form and grow as our narrator sees the last glimpses of his life and prepares to face the next step of existence. David Blomqvist plays his only solo on the album here as Robert Sennebaeck and Richard Diamon refuse to let the solo dictate the song. The bass and rhythm guitar return to the pseudo chorus but with more room to shine as their slight variations are heard much more easily. While the power chords are in command Blomqvist holds on to long notes and uses vibrato and a very controlled bend but as soon the melodies charge from the rhythm players he creates his own lightning fast melodies until he decides to play another variation of the overture but this time much higher up and changes the intrigue from the note selection to resolve and confidence. A completely unique and creative way to attack solos not through the dominance of one player but by the combined talents of a unit moving forward. Some true counterpoint is even established at some moments but that is a topic for another day. The riff changes pace into a speed metal eschewing the melody from its first iteration as the song has achieved its apex and must continue to build momentum from the ground up. The protagonist in his thoughts has died multiple times and is completely at peace with the process. Notice how our narrator completely removes anything related to suffering at this point on. A melody appears this time to push the theme of finality by not letting up the pace but completely transitioning to the harmonic minor scale while avoiding the more exotic note choices so that nothing may be left unresolved. A chromatic note slips very quickly while the lyrics separate all that is flesh bound and that what is truly transcendent. The riff marks the ascension process of man moving unto the second world away from the mortal coil. The growls return to the previous riff enforcing an almost chanted ritual of what these men wished to transmit. The counter melody returns showing another change of heart. An attachment to this world and a feeling of loneliness as the unknown always scares humans. This is not a return to the thought process at the start but man’s basic need to leave behind greatness and a lasting legacy to keep him attached to life. A final riff appears to conclude this death metal symphony. The counter melody returns again but gives way to that final melody which features the same notes from the phrygian melody but this time lacking the root note yet confident in its resolution of the song through a Black Sabbath pace and the root note making a brief appearance towards the end of the phrase hinting that though the storyteller believes in some form of afterlife, ultimately there is no way of knowing and that through patience determination and facing one’s fears, we may hope that our greatest victories are kept alive either through those alive or through those still living. The overture closes the track showing that whatever goes on in our heads the ultimate truth is that we are all drops in the everflowing stream of death. Though the Swedish death metal scene has been reduced to “that chainsaw” sound and the groovy riffs of Entombed, it is easy to forget that somewhere along the line that a few bands exploded quickly on the scene with albums showing wisdom far beyond the combined years of the individual members and though all the musicians’ later birthed some truly horrible material. A few of those records have pushed them into the Pantheon where they remain immortal well after our exit from this earth. HEY DMU STAFF, PLEASE DO A TRANSMETAL POST !! Great job! An analysis of Sacramentum’s « Far away from the sun » would be very interresting too. An analysis of the recording techniques would be a great addition as well. These analyses are an amazing and laudable initiate, kudos indeed! *I’d be more than willing to volunteer, if need be. PS. I second “Urvas” request regarding an analysis of “Far Away From the Sun”. Really get’s the ol’ noggin’ joggin’ on who spell checks the — presumtive — spell checker. Something more positive: I’m looking forward to reading this once I have the time to. The minute explanation made me see more of this but I still don’t like it. At best, this comes accross as people expressing themselves in a foreign language as good as they can. Even the opening motif – which is arguably good – already seem to be a preposterous mannerism. Interspersing variations of that with “swedeath” (hate this term but it fits here) just make an odd conconction. I think I’ve moved past HM2 bands but if it has to be this simple, punkish stuff, I very much prefer it to be honestly simple and punkish.